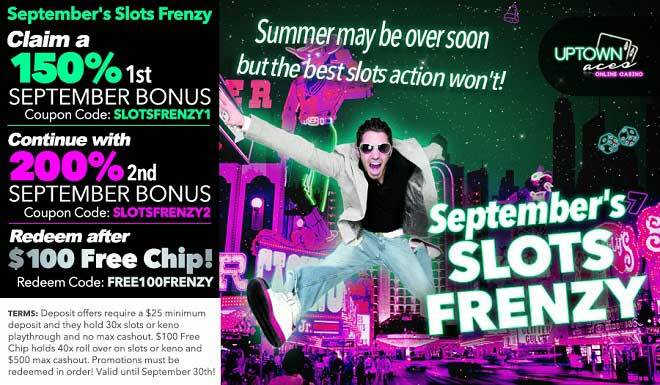 Uptown’s September's Slots Frenzy + $100 Free! The leaves are getting ready to change color, which means your wardrobe is also about to change and you’re going to slip into something a little (or a lot) more comfortable! Say goodbye to summer in the most elegant Uptown style when you deposit as little as $25! The conclusion of summer doesn’t mean it’s time to end your slots action, it means it’s time to kick it up a notch as we head to the last part of the year! First you’ll be enjoying a 1st 150% Match, continue on to a 200% Bonus and welcome a new season of wins with a $100 Free Chip! As summer winds to a close, you get near to even more huge wins with Uptown’s frenzy of slots bonuses and free cash!